As I mentioned on Tuesday, Monday night’s council meeting was started with a presentation by Tanis Douglas, Bowker Creek Initative Coordinator, and Jody Watson, chair of the BCI, about the BCI’s activities in 2008 and proposed activities in 2009. Tanis gave the bulk of the presentation then Jody then finished with a few final points and a call for funding for 2010 through 2012. One of the major goals of the BCI is 2009 is the creation of a Detailed Watershed Implementation Plan or DWIP, which, when finished, will lay out the blueprint for what exactly needs to be done in the future to make Bowker Creek a better place. This will replace the Integrated Stormwater Management Plan that already exists. Jody mentioned that the DWIP will allow the BCI, its member municipalities or some group thereof to make funding proposals to senior levels of government to tap both climate change and stimulus funds.The full report is planned to be finished later this year. Of particular interest to Oak Bay residents in 2009 will be the work done near the Monleith allotment gardens to clear out some of the non-native species and establish a few more allotment plots, which should reduce the huge waitlist. Also, the BCI is following with interest the redevelopment of Oak Bay High, as they would love to do some work on the section of the creek between the field and the running track, however there has been as of yet no communication between the school board and the BCI about that work. Allan Cassidy grilled Jody for several minutes about whether or not the BCI had delivered on its promise to leverage “3 to 5 times” what the municipality was paying in. He also commented that Oak Bay views Bowker Creek as an “asset” as opposed to Saanich and Victoria’s views of it being a ditch. The funding opportunities were the only things that drew him to the BCI in the first place. Speaking of funding, Oak Bay currently pays in about 11,000 a year towards Tanis’ salary and other incidental costs and this will rise by 3% each year over the next 3 until 2012 when the funding commitment comes up again. The council ended up approving in principle funding until 2012 but I fear that because of the slow pace that any creek restoration takes and the jurisdictional challenges facing the BCI, come three years from now, some council members will be less than impressed with their work. Tomorrow afternoon is the Bowker Creek cleanup and annual rubber ducky race. The cleanup starts at 10am behind the Oak Bay High East building parking lot and the rubber ducky race starts at the St. Ann pond just west of St. Ann Street (across St. Ann from the Fire Hall). Hosted by Oak Bay High’s Environment Club, this is the 11th annual, which makes me feel a bit ashamed that this will be my first time going. Last night the Friends of Bowker Creek Society and the Oak Bay Green Committee co-hosted a well-attended forum on urban watersheds and urban forests. The forum was an outgrowth of an internal effort by the Green Committee to get arborist Jeremy Gye to speak to them but ended up growing into the public forum with both Jeremy and Ian Graeme of the Friends of Bowker Creek speaking. Jeremy’s talk was an excellent introduction to the values and challenges of trees in the urban context. He recently finished doing work for the City of Victoria looking at their urban forest and the massive challenge they face in the near future due to their mostly uniform age trees. This is also a problem that Oak Bay faces and given most of these trees are reaching the end of their life, both municipalities are going to need to spend a lot of time and money not only replacing those trees but also working with the public to understand the process and get them involved with it. Ian’s talk on Bowker Creek was shorter and covered the watershed aspects of the evening. Aside from a basic introduction to what a watershed is, he gave us a tour down Bowker Creek by canoe. Given all the culverts, this involved a great deal of portaging down streets like Shelbourne. I would love to see a canoe race down Bowker Creek as a way to fundraise for the Society and raise awareness of Bowker Creek in general. One of the more serious ideas presented was the idea of a Bowker Creek Greenway (PDF). Ian made the point that the new Baptist Housing lacks easy access to Bowker Creek Park, as the section right by the Rec. Centre is bounded on either side by parking lots, a sad waste of an opportunity if I have ever seen one. There were also excellent tasty treats and coffee, a must for any public event. Half the time I think that people show up just to get some free food. Speaking of people, I was pleased to see both Councillors Tara Ney and John Herbert come out. I have said this in the past and I will say it again: Tara’s election has been a major boon for Oak Bay and she has made an excellent councillor even in the few short months since she has been elected. I am continuely disappointed at how few community events our elected representatives come out to. After the two talks and a bit of eating, there was a short discussion period, which raised several excellent points about education, especially to the young. One suggestion made was to have a package of information to new home-owners to tell them about what sorts of native trees and habitat are already on their propety, in the hopes that they preserve it. One commentor also lamented the lack of native flowers at Buchart Gardens, noting that there were only native trees. With the challenges of getting preserving and increasing the size of the urban forest, Jeremy noted that an excellent source of Garry Oak seedlings are uncut lawns. Lots of yards with mature Oak trees, if left uncut would yield dozens of seedlings. 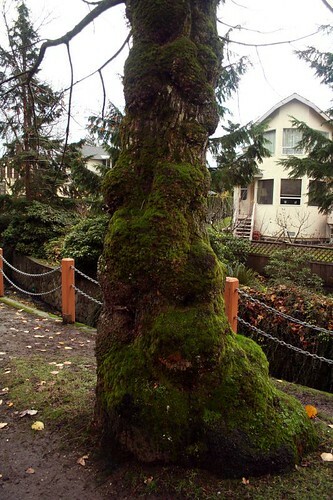 Maybe Oak Bay Tourism could sell these native trees instead of palm trees. I am not holding my breath. In the next month or so there will be a bunch of events surrounding Bowker Creek. 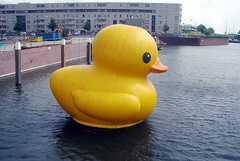 On the 30th of this month there is a cleanup and rubber ducky race. The cleanup starts at 10am behind Oak Bay High and the race at noon near the fire hall. On June 13th there will be a Bowker Creek Celebration Walk starting at 1pm in the upper parking lot of the Oak Bay Recreation Centre. Overall, it was an excellent event. I am glad that the Oak Bay Green Committee and the Friends of Bowker Creek Society were able to put it on and like several people mentioned, there is sense that maybe change is in the air. Maybe in the next few years, we will get critical mass on getting a greenway built along Bowker Creek, connecting Oak Bay into the Lochside Trail and beyond. As a final note, this coming Monday, the 25th, Council will be debating their continued support of the multi-municipality Bowker Creek Initiative. It is vital that the funding for this continue, so come out at 7:30pm at the Municipal Hall and tell council to support Bowker Creek and fund the BCI.